Dan Murdey is revolutionizing an age-old concept. His dedication to buying locally is revitalizing an approach to business that is easily lost in today’s profit-driven environment. This practice brings a breath of fresh air in a corporate culture that often forgets the revitalizing effect that sourcing and buying locally can bring about. Such a bold approach has given way to more than just amazing surfboards, as the result have been a rejuvenation of local businesses and communities that get to partake in this movement. What started in a side garage while Dan was growing up in Seattle has grown into a phenomenon that has swept the Pacific Northwest away. His stoke to make the best boards possible has been matched by his love of this corner of the country, so it only made sense to support local businesses while building these hunks of beauty. The folks at Murdey Surfboards have been injecting their quality sea sticks into the surf community for a healthy amount of years now, and one of the ways that they cater to their customers is creating some serious waves. Diving deeper in order to emerge with a surfboard that truly connects with its rider, Murdey treads the waters of personal customization. Imagine your dream board. Now, picture working with your local shop to place a special order. Finally, fantasize about slaying every wave that rolls your way on a surfboard that was designed from your specifications alone. Yes, Murdey is that awesome. When you need a model that can dominate in all conditions, look no further than Murdey’s Thruster Shorty Surfboard. With a wide thumb tail and plenty of body that sleeks into a sharpened nose, this stick can handle it all. Murdey built this board to give surfers a solid choice for a wide range of encounters. 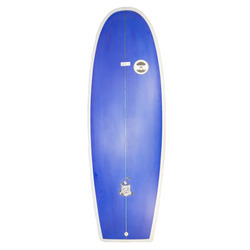 A low rocker profile, full rails, and a flatter deck equips this model with nice wave catching ability. The nose lets you make drops later and even fit into tighter sections. Go anywhere and ride it all with surfboards like the 6’5” Thruster Shorty. 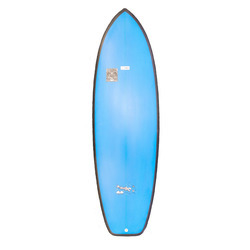 Catching waves is like shooting fish in a barrel with choices like the Murdey Quad Fish 6’0” Surfboard. Speaking of barrels, you will find yourself deep within lots of them and then squeezing out the end as this compact piece lets you get deep and then rip through with impressive speed and unparalleled reaction. The goal of Murdey is to produce boards that never sacrifice connection with the water, and ones like this are all about developing that relationship through performance and quality. Buying locally, energizing communities, and supporting surfers with the best boards possible make Murdey a brand you will want to paddle out with again and again.